Las Vegas, NV – A group of former Disney and Universal Studios executives, designers, architects and engineers have teamed up to propose a new destination resort in Las Vegas featuring an indoor ski dome as well as North America’s largest indoor water park, two hotels, a casino, an events arena, and retail and dining options. 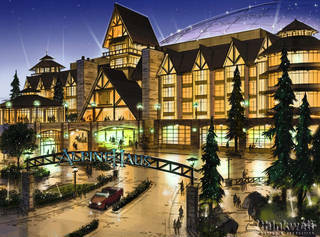 An artist’s rendering of the Alpine Haus hotel and snow dome proposed to bring indoor skiing to Las Vegas. The snow dome for indoor skiing and snow play and Swiss-chalet themed hotel are planned to encompass 40 acres of the proposed Las Vegas Wet project. The waterpark itself will consume roughly 30 acres, with 250,000 square feet of that indoors, allowing the park to operate 365 days a year. The proposed attractions and entertainment components alone will exceed the size of Disneyland. “Think of it, you can throw on ski gear and practice your downhill technique on real,…OK, manmade snow, then change clothes and surf at the waterpark, all in the same day at the same place,” said Dooner. The design team is focusing on making the project as environmentally friendly as possible. “We plan on using solar panels wherever possible to generate electricity, and microturbines to heat and cool the buildings and the water. We will be the first project in Nevada to use fuel cells to generate electricity,” said Dooner. The plans also include landscaping that uses as many native plants as possible, in order to reduce the need for water consumption. The group claims Wall Street backing of $1.1 billion.